​Our CP012 fits openings up to 12 inches wide, is 17” in length and can easily be trimmed with a kitchen scissors. Each unit is built with industrial grade plastic strips and we give you 100% overlap to help block out the rain, snow and drafts, as well as hold in the heat. Our aluminum mounting hardware will last for years and needs no maintenance. 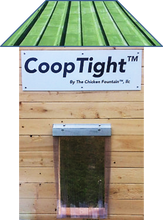 Every unit is shipped fully assembled and ready to install on your coop door opening.